C&E Media’s oldest and most successful title, StyleSpeak, the veteran of the salon industry, enters its 13th year this November. Launched in 2002, StyleSpeak is India’s first trade magazine to cater exclusively to the Indian Salon and Spa industry, addressing their unique business and creative needs. The monthly publication enjoys a readership of over 4, 00,000 industry professionals and has been the launch pad for many stylists, salons and professional brands. 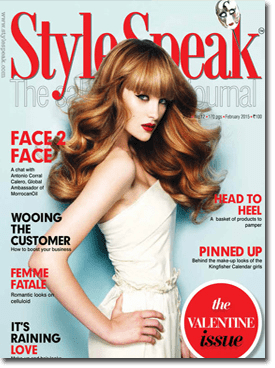 With a circulation of as many as 47,000 salons in India, StyleSpeak is the largest circulated monthly title and is considered the voice of the Industry. Every month the magazine generates unique content, like Trends in Hair & Make-up, Face to Face interviews, Salon Reviews, Bridal Make-up & Hair tips, and Gadget Innovations etc. StyleSpeak also holds special shoots for its cover images, associating with leading hairstylists, make-up artists, salon business experts and top brands. Each of the 12 issues of StyleSpeak has a particular theme, so as to provide insight into every sector in the industry in a detailed manner. Apart from the issue specials, StyleSpeak also produces additional Supplements that go free with the issue. These include, Gadgets special, Education, Nailathon and even brand led supplements. These supplements give a detailed look into the theme of the issue in an easy quick format. All of this and more makes StyleSpeak a favorite resource among salons, technicians and entrepreneurs alike. It provides inspirational content to the artist while assisting the business aspect making it THE GO-TO magazine for anyone seeking success in the Indian salon industry.